It’s beginning to look a lot like Christmas, and ski season too in Mt Washington Valley. We look forward to continued cold temps creating ideal snowmaking conditions, plus with a little help from mother nature anticipated in the near future, not to mention flurries on a regular basis, a few of our XC Centers have been able to open early this year. We’ve already had 34” of natural snowfall reported at Wildcat and 19” of natural snow up at Bretton Woods so far this ski season. An amazing start to ski season is underway in Mt Washington Valley. Attitash – Snowmaking underway. Anticipated opening soon with top to bottom skiing at both Bear Peak and Attitash. Stay tuned to the ski report for opening day. Black Mountain – Anticipated opening: Saturday, December 10, 2016. Snowmaking underway throughout the mountain. Bretton Woods – Open and skiing on 10 trails, 4 lifts (73.4.6 acres). Base depth: 4-18”. Snowfall in season to date: 19”. Skiable terrain more than doubled this week! Cranmore – Re-opening for daily operations on Saturday, Dec 10, with average base depths of 6”-12”. 4” of new snowfall in the past 24 hours. King Pine – Anticipated opening: Friday, December 16, 2016. Snowmaking underway and 3” of new snow reported this week. Shawnee Peak – Anticipated opening: Saturday, December 17, 2016. Snowmaking underway as temps allow. 3” of new snow reported in last 24 hours. Wildcat– Open and skiing on 9 trails (7 groomed), 1 lift. (47 skiable acres). Base depth: 12”-32”. 2” of snowfall in past 24-hours, 34” of snowfall for the season to date. Bear Notch Ski Touring – Open for complimentary skiing on 0.5km of early season skiing on the Upper Meadow. 2”+ snowfall reported this week. Bretton Woods Nordic Center – Opened on 12/6/16. Presently offering 10 trails/17km untracked and ungroomed trails. Base depth 4”-8”. Snowfall to date: 19”. Great Glen Trails – Opening day: Weather dependent. Jackson Ski Touring Foundation – Open for skiing on 4 trails, 11.1km groomed. Base depth: 1”-5”. 7” of snowfall reported to date. Purity Spring XC and Snowshoe Reserve – Opening day is weather dependent. 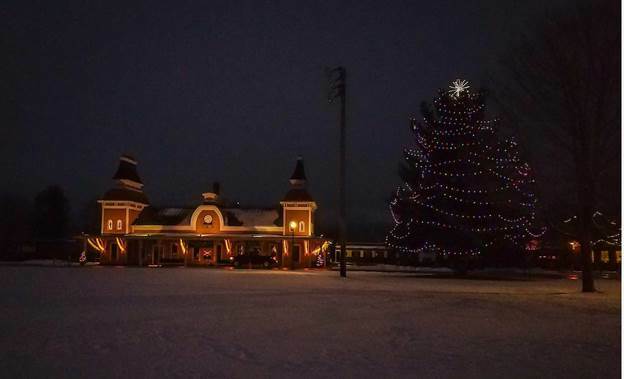 · Bretton Woods XC: With 19” of snowfall to date, Bretton Woods XC Center was able to open early this year. Photo by WiseguyCreative.com on 12/7/16. · Wildcat: So far 34” of snowfall has been reported, combined with great snowmaking temps this week, giving skiers and riders some fabulous early winter conditions at Wildcat. Photo by Ian Connor, 12/7/16. · Northern Extremes Snowmobiling: Anticipating a fabulous year, Northern Extremes Snowmobiling unloads a shipment of brand new Skidoos. Northern Extreme Snowmobile Rental in Bartlett, NH just received a shipment of new Ski-doo’s to rent!